For over 1000 years Kyoto was Japan’s capital city. During this time, signature images of the country were born: Zen temple gardens, geisha, the tea ceremony -- all were cultivated in this ancient city. It is for this reason that Japanese from all over the country come to celebrate their wedding at one of the thousands of shrines, temples or traditional restaurants. At Kyoto Weddings, all of this is now accessible to international couples. We are the only wedding planning service exclusively serving international guests. 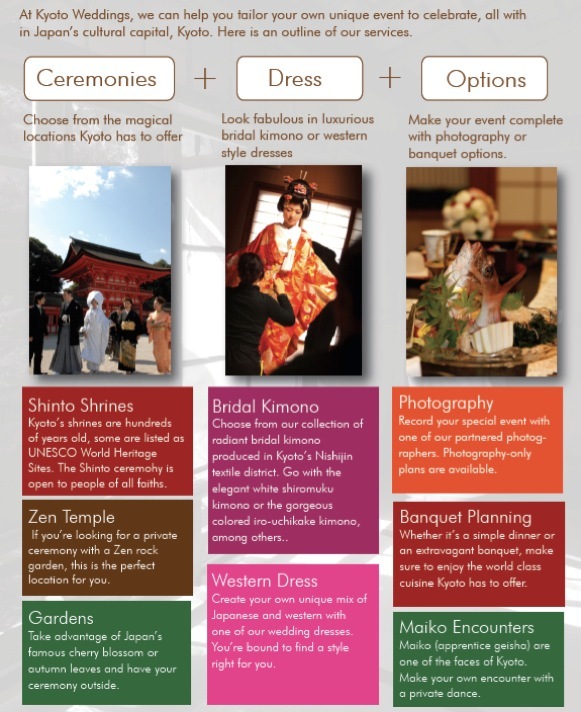 Focusing on Shinto shrine ceremonies and garden weddings, we can help you plan the perfect destination wedding in Japan. Kyoto Weddings is partnered with TNC Bridal Service, one of the first wedding planning companies established in Kyoto. Located in the heart of Kyoto, our offices feature in-house kimono and wedding dress rental. Our bilingual team of native and international staff not only have the expertise to coordinate your special day, but can also give you the cultural context to Japanese bridal traditions, and deepen your experience of a Kyoto wedding. For information about our terms and policies click here . TNC Bridal Services (Kekkon Biyori) - TNC Bridal Services is a leading wedding company in Kyoto, specializing in dress/kimono rental and wedding planning. There are two divisions: IBLOOM (wedding dress rental) and Kekkon Biyori (Kyoto Style Weddings). Kekkon Biyori offers traditional Japanese wedding planning at local shrines, temples and ryotei restaurants. For more contact information, please see our contact page.